@darchangel; sure, #8 is yours. Enjoy! We don't normally give out diagonally neighboured tiles unless you have a reason (such as drawing someting so big that you need all 4 neighbours open). So unless that's the case I'd like you to pick one with a straight neighbour. @Drazile; Good job! #2 turned out great. Oh, i understand, then i can pick the 23? Excellent, perhaps its shadow could be improved. One could say the tile is a little empty but that’s not necessarily a bad thing. Claiming #1, let's see what I can come up with. Gecimen, that lava mini-volcano looks rather plain gorgeous indeed for a start as to what your Tile #1 will soon look like when it is all finished, and you have quite such a splendidly wonderful vision yourself in how it is being made overall indeed. That said now, a QUITE FANTASTIC start for you so far once again, as I just cannot wait to see where your latest current tile is headed the way you create so damn phenomenally as always!!! !! Also now, since your selected Tile #43 is right next to one of my already-completed tiles with a mini tar volcano and some newly blooming plants made literally out of pure emeralds, I am surely confident that you are gonna do a truly amazing job in what you are gonna come up with for your tile as according to your own awesome vision in what you are gonna give it. As such, I wanna wish you the ABSOLUTE best of success indeed on making it all happen, and it is such a sheer pleasure to meet you here on this *very* special project!! Again, welcome!!! !! I see are already doing the bottom tile, so when he finish I can readapt. - If that's a snake's head, however giant it is, it looks far too big. If that's a skull or something, it can stay as it is, but if you want your top neighbor to continue it, you could shrink it to a more realistic size. - Some grass and stone texture will make your tile look much better. I guess I lost my claim on #41.. A shame since I was hoping to get back to it but I do understand. I've been checking back here regularly but I haven't really been keeping anyone up to date at all and I'm very sorry if I held anything up. Realizing how long it's been I feel like I owe everyone a bit of an explanation for vanishing after posting a WIP. My house got broken into a few months back and my desktop was stolen as well as some gaming systems and a few other things. I live in a sh*tty neighborhood and didn't lock my doors. They left the tablet I use to draw but apparently broke the USB connector on it when they were forcefully disconnecting everything. I can kind of get it to connect if I get everything to settle just right but as soon as I start drawing or shift it even imperceptibly it loses the connection. If it connects and disconnects in the perfect wrong way it can also bring my PC down with a bluescreen. It's been a while since it was broken but I haven't gotten around to replacing everything yet. Moving on from that depressing topic. 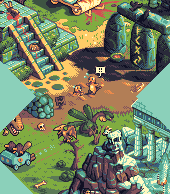 A lot of the tiles are fantastic, and it's been great being with this collab as it's evolved. I've actually learned a lot just seeing how everyone here had adapted to the pallet and I'm constantly impressed by the amount of detail everyone has been able to squeeze out of such a confined format. I hope I can get back into it later, because this has truthfully been a fantastic experience overall. You don't owe us any explanation though, but you know I had to remove your reservation after not getting a reply to my PM; it just happens; no worries. 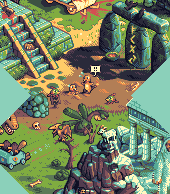 Whenever you can pixel again, come and claim another tile! I thought kolkurtz was with him on wip. Just the head, the tail is within acceptable limits. WIP for number 8. I will adjust the bottom as GhostPlayer changes his. Looking cool so far but it would be really sad if you leave all that huge area empty. @Dawnbringer; yeah perhaps lava should be a little more red-ish under daylight but it's not like we're going for photorealism here. Our palette is really limited in the red scale. Can I have 62 please? Awesome tile s.g.m. ; we don't normally permit neighbouring tiles done by same person, but as these tiles seem unrelated conceptually I won't waste your effort and allow it. Please pick a separate tile next time, thank you! Too many people who have WIPs have disappeared lately, did some cleaning, and will do some more next week. Thanks, Gecimen. 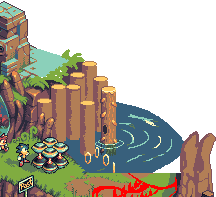 Just realised I forgot to upload an image of my tile isolated from the rest, sorry for giving you extra work ! Could I snag tile 17? @s.g.m: fabulous! you’ve made a flashy entry to the collab! keep up the great work.